"You could not persuade me to visit a foreign country," stated my 'she said' reviewer following the Amy Schumer and Goldie Hawn mom's day comedy , "Snatched," where mom and daughter are kidnapped again and again in Ecuador and Columbia. Neither Schumer nor Hawn have the snap snap repartee which peppered "Heat" (Melisa McCarthy, Sandra Bullock), "Sister Act" (Whoopi Goldberg), or "Legally Blonde" (Reese Witherspoon). The 'screwball' antis of Streisand ("What's Up Doc,") and Katherine Hepburn ("Bringing Up Baby") are not goals either. However, they do have essential sarcastic, blunt, moody, and indelicate lines accompanied by a couple of brief scenes involving Schumer about which I can't describe in print. Call it breezy and filled with enough curves for requisite smiles. 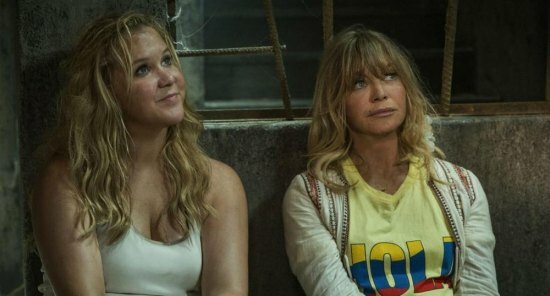 The premise has the abandoned by dudes and friends Schumer persuading her mom (Hawn) to come with her on an Ecuador vacation for which she has already paid. Mom's a solid, 'no,' and the one near me at the screening , quipped , "Someone has to stay home and rescue ..." I'll edit that. Spoiler issue. Once in South America, the two women meet a retired agent who had her tongue removed to prevent blurting secrets under torture. Schumer dead pans, 'couldn't they just torture until she write them down?" Hurting and dude starved Schumer falls for a good looking guys invitation to tour off the beaten path portions of the country. She drags mom along. Of course, you know there will be a ransom demand. "Snatched" stands solidly on recollections and insinuations to films in the genre. One running gag has Hawn's son trying to enlist a U.S. led "A Team." Meanwhile, Hawn and Schumer fall into perils reminiscent to "Romancing the Stone." Of course, neither 'she said' nor I can forego a footwear jab. Going back to "Jurassic World," the female lead as a supervisor wore her sensible pumps throughout jungle dino encounters. Hawn has done that too --- remember, "Sugerland Express" , for instance. "Snatched" has a millennial who just got fired opposite Hawn. She does the entire adventure in FLIP FLOPS, including fancy kung fu styled maneuvers and jungle survival. My 'she said' laughed, "I can't keep my toe between the rubber when I'm dancing and drunk, so how can Schumer...."
The mom/daughter bonding is an anticipated cliche. But the adventure does have a good share of surprises and laughs are enjoyed, just not the instoppable wacky kind that leaves you gasping for a breath. Hawn allows Schumer to carry the picture, which is a mistake. Goldie's character could stand for more quirks than just a divorced, overly protective, slightly dysfunctional mother.